Be more productive, collaborative, and get more done faster using Cisco WebEx Meeting Center — the proven industry leader in web and video conferencing. 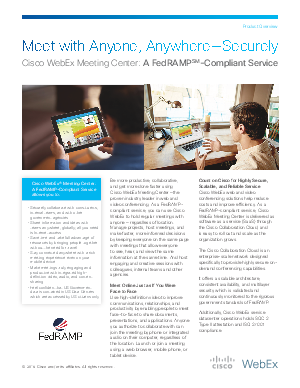 As a FedRAMPcompliant service, you can use Cisco WebEx to hold regular meetings with anyone — regardless of location. Manage projects, host meetings, and make faster, more informed decisions by keeping everyone on the same page with meetings that allow everyone to see, hear, and view the same information at the same time. And host engaging and creative sessions with colleagues, internal teams and other agencies.